ALERT to website visitors: Please note that we are NOT soliciting funds through an intermediary or vendor. If such a request has led you to this page, please inform us immediately. The Race Matters Institute helps organizations improve their mission performance by the use of policies and practices that work for everyone. As such, our focus differs from, but complements, the work of those who offer services around organizational diversity and inclusion. Diversity refers to the wide array of differences among people and their perspectives on the world. It is an important organizational goal in its own right, but a diverse workplace is not necessarily an equitable workplace. Inclusion is reflected in organizational culture where diverse peoples can raise their perspectives authentically, and where those voices matter and impact decisions. Promising a broader view of the world and a more democratic process of decision-making, inclusion is an important organizational process goal. But it does not automatically guarantee equity in an organization’s results. Equity refers to results where advantage and disadvantage are not distributed on the basis of race and ethnicity. Strategies that produce equity must be targeted to address the varying barriers experienced by different racial-ethnic groups and communities. Equity requires informed policies and practices, intentionally designed to promote opportunity and rectify disparities, as well as informed people positioned to implement them effectively. 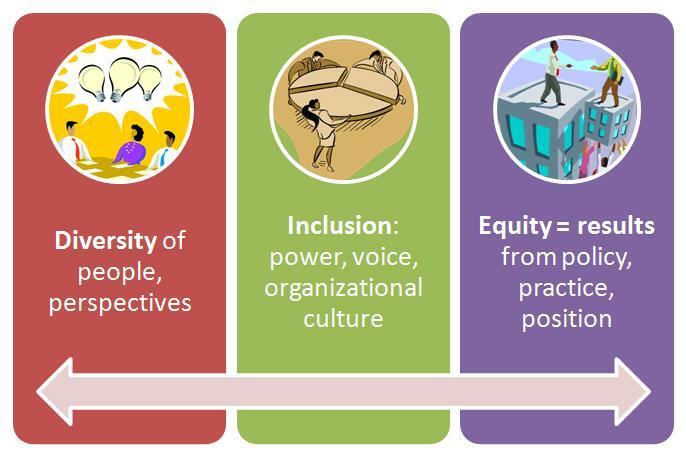 You may want to take our Racial Equity Organizational Assessment to see where your organization falls with regard to these distinctions. highlight and build on client strengths as well as address their needs for being a fully race-informed organization. listen to clients in order to co-design the specific services to be offered. use evaluation forms and debrief following each step to incorporate real-time feedback into subsequent work. promise a productive relationship with no surprises!